You know, to celebrate Valentine’s Day. Because nothing is more romantic than beans, amiright? Okay these clearly have nothing to do with Valentine’s Day BUT there’s a strong chance that cooking them will make that someone special fall in love with you. Or at least me. I’ll fall in love with you. 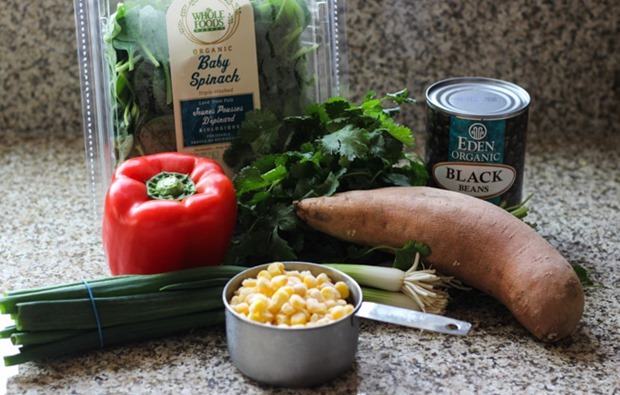 Roasted sweet potato, black beans, green onion, corn, red pepper, cilantro and LOTS of spinach. Just the way I like ‘em. Packed full of veggies! I don’t like them to be complicated though so I used jarred salsa and store-bought tortillas. Gasp! I know, I’m so inauthentic. But you guys, as long as you use a quality salsa (or enchilada sauce), they’re just as good. Just make sure you read the ingredient label to check for added sugar and other unnecessary garbage. So yeah, I like to take a few shortcuts here and there but the main goal for me is that they’re nutritious while still tasting good and they are most definitely that. I mean just look at how colorful and green the filling is! Bonus: they’re also pretty easy to throw together. 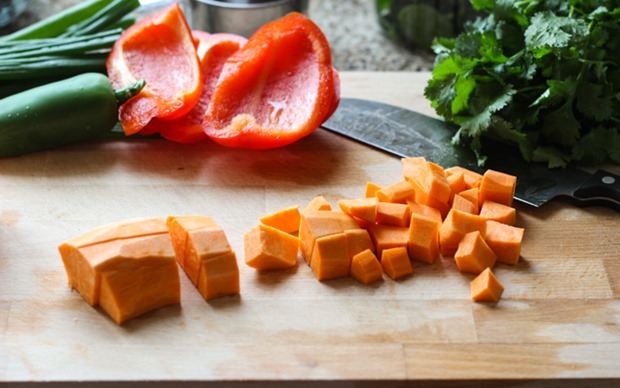 You roast the sweet potato for 25 minutes (in the same dish you use to cook the enchiladas! ), chop the other veggies, add everything to a large bowl with lime juice and seasonings and stir it together, then scoop it into each tortilla, roll them up, top with salsa and cheese and bake in the oven for 35 minutes. Then blammo! 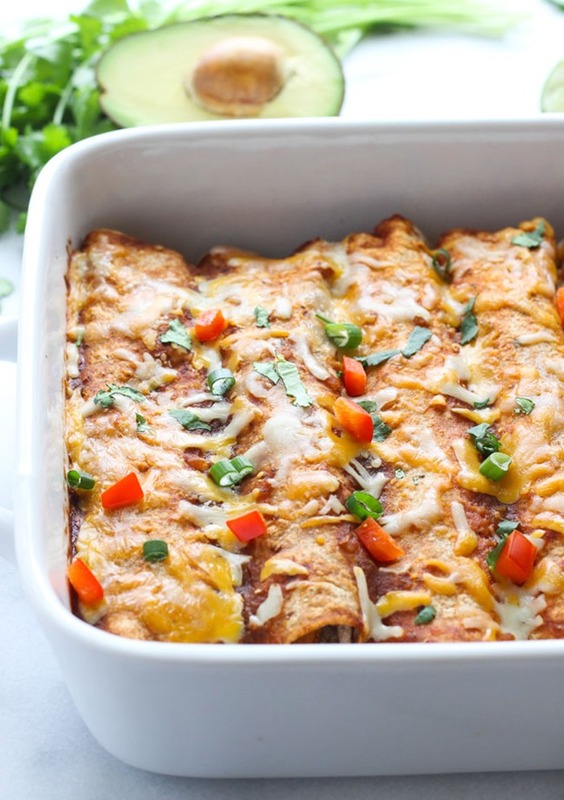 Light, flavorful and healthy enchiladas are at your fingertips. With less than a total of 30 minutes to prep, they’re even easy enough to make on a weeknight. Although you can always freeze them prior to baking to have ready for later as well. 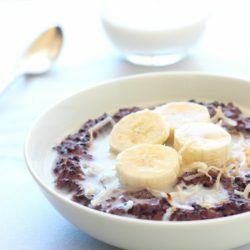 The husband and I went nuts for these and I’m sure if you give them a try, you will too. Preheat the oven to 400°F then place the diced sweet potato in a 9 x 13” casserole dish. Using your hands, toss the sweet potato pieces with one tablespoon of high heat oil until evenly coated. Bake in the oven for 25 minutes, until tender. Meanwhile, in a large bowl, combine the black beans, chopped spinach, corn, chopped bell pepper, jalapeño, sliced green onion and chopped cilantro . Once the sweet potato is done, reduce the temperature to 350°F then add the cooked potato to the bowl as well. Sprinkle in the spices and add the lime juice. Stir together until well combined. Lastly, add 1/2 cup of the cheese and stir to combine. Spread a thin layer of salsa over the bottom of the casserole dish and set aside. Scoop the vegetables into the tortillas one at a time so that it fills the center. If you position the filling at a diagonal angle to the tortilla, it makes it easier to roll up. Roll each tortilla then arrange them in the casserole dish seam side down. Once all of the tortillas are arranged in the dish, top with last of the salsa and sprinkle with remaining cheese. Cover the dish with foil and bake for 20 minutes. Remove from oven, uncover, then return to the oven and bake for an additional 15 minutes. Serve warm and garnish with diced avocado and/or cilantro. Leftovers can be stored in an airtight container for up to 4 days in the refrigerator. If you would like to freeze them, do it before adding salsa and baking. I have a recipe so similar to this on my blog back in 2012, I think. They are so good! Yours looks amazing! I’m glad you mentioned to check the label on the salsa or enchilada sauce because sugar is in everryyyything. I love making my own enchilada sauce, it’s so easy! So much color swaddled all up in that ’tilla, I just love these veg enchos! There’s only so many steps a girl can take to make glory happen, so store-bought tortillas and salsa’s how I roll too – ain’t not shame in it! I see many-a-sweet potato black bean spinach encho in my future. As in, may I please make these tomorrow and eat the whole batch while watching every episode of Golden Girls ever? Have a great weekend, m’dear!! 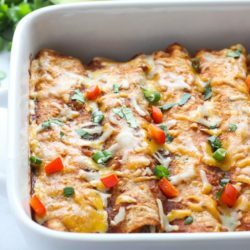 Enchilladas are the best comfort food!! They are especially good to soothe me through all of this darn snow and cold we are getting here in Toronto! It’s the worst! Maybe I should just make these with a good margarita and pretend I’m in Mexico? Ha. These sound so wonderful – perfect for a night in! Hello, gorgeous <3 Salsa, guac, and cheese are the keys to my heart. Throw some chocolate in afterwards and I'm basically yours. And your apology for using store-bought sauce and tortillas makes me feel extra bad that I've never even considered making my own :P These look amazing, girl! Pinned, pinned, pinned. These look great! 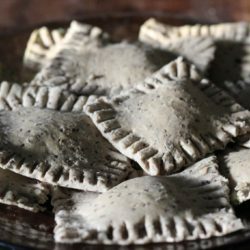 I plan to make them when my daughter comes home from college on break next month, because she will love the flavor combos in them! 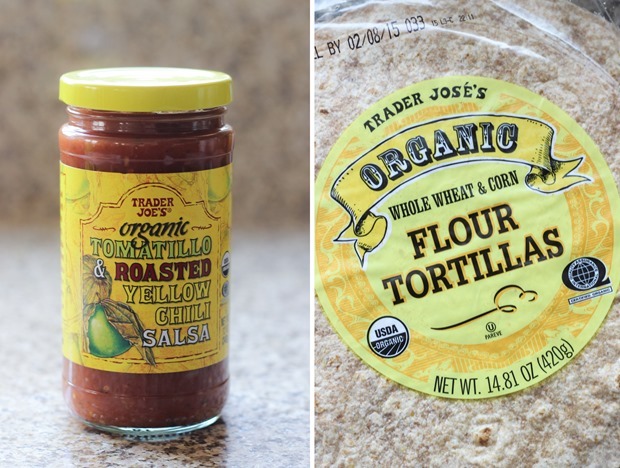 By the way, that Trader Joe’s salsa is our family favorite around here as well! Nothing wrong with taking shortcuts! 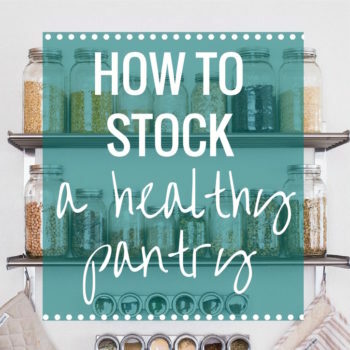 There are lots of great healthy packaged foods, so why not take advantage of them. Who has time to make homemade tortillas anyways? Haha. These look super delicious! 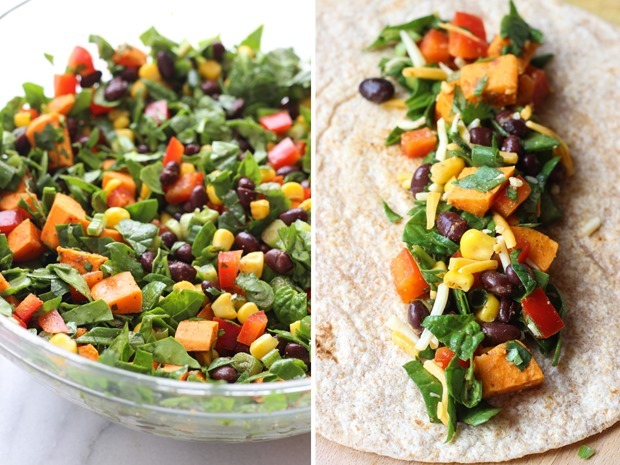 The sweet potato and black bean combo is one of my favourites. 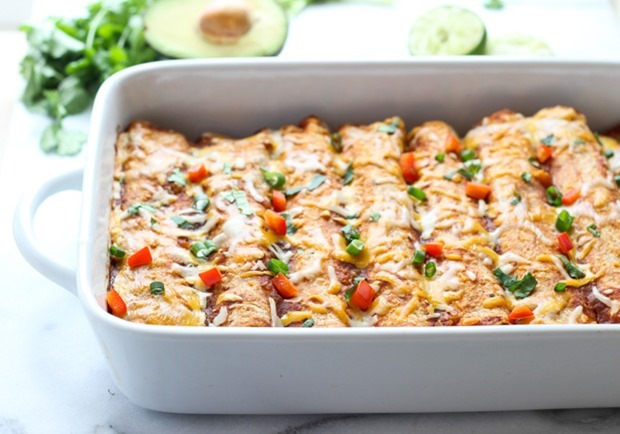 Umm… these are the most gorgeous enchiladas I’ve ever seen. Can enchiladas be pretty? Haha! And are we now changing the song to “Beans, beans the romantic fruit…” ;) Have a wonderful weekend, dear! They’re so pretty! I’ve never seen “pretty” enchiladas before, so that’s impressive haha. I would love these, but the husband doesn’t like sweet potatoes (he’s weird). Happy Valentine’s Day! These look delicious! Nothing wrong with a few shortcuts here and there. Thanks for this recipe. Enjoy the weekend! WOW, I really love the incorporation of sweet potato! It’s a unique twist but would definitely add a ton of flavor and great texture. My bf would actually eat these too! I love the combo: black beans and sweet potato. I bet this enchiladas are so delicious and flavourful! Pinned it for later! I for one think beanies are quite romantic :) I could totally cozy up with a big plate of these honkers (followed by your chocolate quinoa cupcakes, duh). Yay for mexican food! I’ll take the whole pan please! 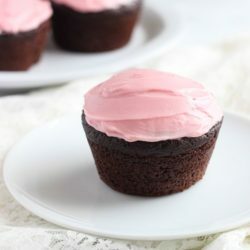 :) These sound delicious – I LOVE the color of that filling! Yummmmm! 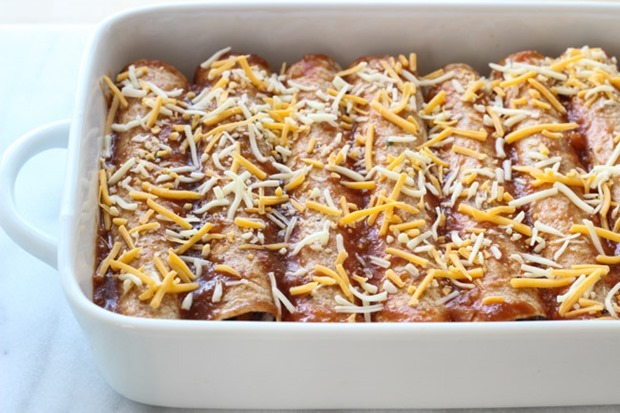 I just posted an enchilada recipe recently too, and now I kind of want to make some enchis. Like right now!! Hahaha…I also made enchiladas for Valentine’s! I figured the romantic cooking together part outweighed the less romantic beans part. Can I just say I absolutely LOVE these! Any idea about the nutrition facts? Or recommendations for healthy sauce? We made these for dinner last night & they were delicious! Very fresh tasting & easy to make~they’ll be made again, thank for the recipe! Just made these with ultra thin corn tortillas (40 calories each) and got 15 enchiladas. I had lots of filling left over (about 24 ounces) , so I added a little celery, onion, shredded zucchini, evoo, and balsamic vinegar and got 3 bags (about 8 oz each) of salads ready to go to work this week. I love your recipe! Thanks so much for posting it. That’s a great way to use up the extra filling! Sounds delicious. Thanks for the feedback, Carol! 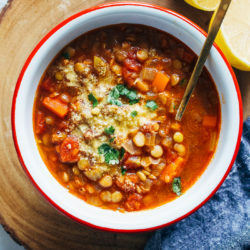 I just made this for my family because my second child recently decided to go vegetarian, and we’re trying to be supportive even if we don’t change our eating habits entirely, and I can’t believe how truly filling and delicious these are!!! The jalapeño we used was very hot, but I will just cut the amount of that in half in the future, and I doubled the amount of cheese, and used a 15 oz. can of corn, drained, and about 3-4C. of the sweet potatoes. But, because they were so filling, we only ate one enchilada each, so I can’t wait for leftovers tomorrow! I wish I could give this more than five stars! Absolutely amazing! Thank you for this delicious recipe. Thank you so much for the review, Marcy! 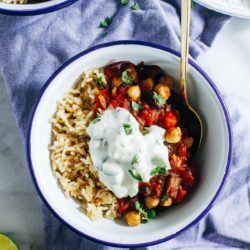 I made these tonight and they are delicious and much more filling than I would have expected. I am wondering however whether the nutritional analysis is correct. That is a LOT of salt. I’m so glad you liked them, Becky! I actually need to go back and update the old nutritional facts on my site because I think the calculator I was using assumed there was salt added in the beans. I use no salt added so if you did too then the sodium should be much less. Other than that, the majority is coming from the cheese which has a good deal of salt. Hi! 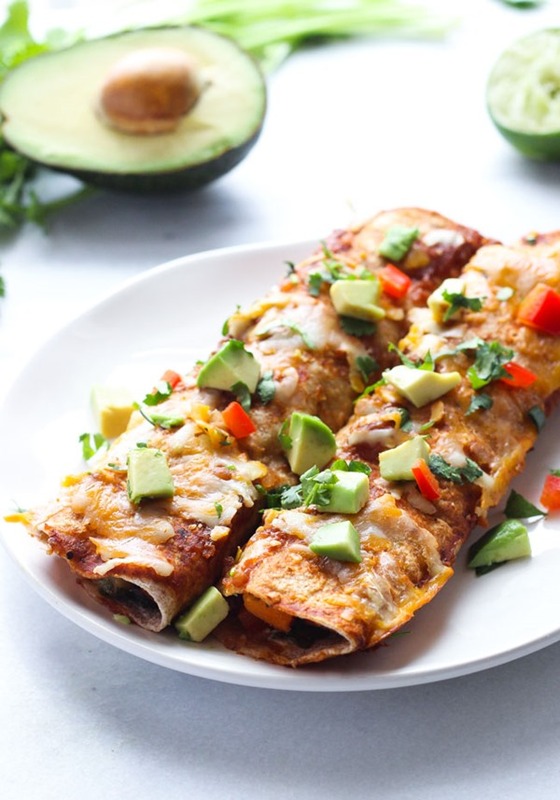 Yummy enchiladas that are more filling and healthier than just a bunch of cheese. I could not see the nutrition facts though on the recipe page. Not sure if I am missing it (others have found it) or it is no longer available. If you could reply with those, it would be greatly appreciated! 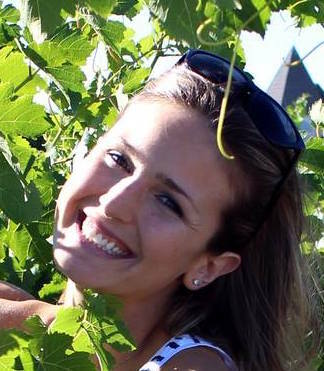 Hi Geena! I am in the process of looking for a new nutritional calculator because the old one wasn’t giving me accurate results. In the meantime you can copy and paste the link to the recipe in MyFitnessPal and it will auto populate the ingredients so that you can calculate them yourself. Sorry for the inconvenience! Does the cilantro go in the bowl with the veggies? Or is it just used as an optional garnish? Also, the cook time is a bit off on the recipe since you have to use the oven in sequence. Thank you! Sorry for the confusion, Lexi! The 1/2 cup chopped cilantro goes into the filling and then you can use any remains for the garnish. As for the cooking time, you roast the potato at 400°F, remove it from the oven, reduce the heat to 350°F and then bake the finished enchiladas at that temperature. It may be a bit warmer than 350°F because of the higher temp but that’s okay. I hope that helps!